Scottsdale's desert summers are hot, dry, and perfect for spending a day at in one of the city's luxurious spas – especially when treatments are on sale and come with full-day access to pools and sundecks complete with ravishing desert views and the cool relief of misting fans. Fresh off a long flight from Atlanta, I was more than ready for my treatments at the Hotel Valley Ho’s mod VH Spa, particularly the hydrating mini-facial, which eased post-flight dryness with antioxidant-rich Chardonnay-based elixirs, and a wonderfully punishing (hello endorphins!) deep-tissue massage. Sunday night is Spa Party Night at the VH Spa, when two treatments of your choice – including specialty massages like lomi-lomi and the spa’s signature pedi – come with a cocktail in the playful Café Zuzu bar and as much decompression time as you’d like in the martini-olive shaped pool for $99 (it’s regularly $190). For a weekday fix that’s only available during the summer, try the sampler package: two 30-minute treatments for $99 ($150 if purchased separately). Monthly specials are also available at hotelvalleyho.com. Even if you’re only having a single treatment, plan to spend the day at Montelucia Resort ’s Joya Spa, which gives new meaning to exotic escapism with glowing Moroccan lanterns hanging from every corner, a nap-worthy “whisper room” filled with white-dressed four-poster beds, and treatment rooms topped by billowy tented ceilings. Located within a seductive, steamy enclave, the hammam circuit – steam, sauna, whirlpool, and a final deluge in chilly waterfall that won’t tumble over you until you pull the cord – relaxes and invigorates. 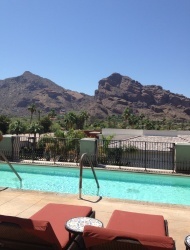 Spa-goers are also welcome to work out in the well-equipped gym facility – which I declined – and gaze at Camelback Mountain from a poolside lounge chair – which I was more than happy to carry out. Whatever treatment you choose, be sure it includes a dose of Joyambrosia, the spa’s exclusive spicy floral signature scent that’s based on a rare blooming cactus that thrives on the property. All summer long, book one treatment and get a second at half price; through July, get a signature Joyeambrosia sugar body polish for$109 during the week, $119 weekends. (Regularly $159/$169). Book any 60-minute treatment this summer at the spa at the historic JW Marriott Camelback Inn and the resort will automatically deduct $50 from the price and invite you to spend the day lolling under the desert sun at the adults-only spa pool, sipping tea in the shady outdoor relaxation room (there’s an expansive indoor room, too, with steam and sauna nearby), taking an exercise class, or hiking along the resort’s mountain trail. With its hot-stone hand and shoulder massage, mini-reflexology treatment, and scalp rubdown, my Signature Facial (regularly $155) was almost like getting two treatments in one. For a taste of Arizona, try the Desert Nectar Honey Wrap (regularly $155), which uses Arizona honey to soothe and moisturize. The Adobe Clay Purification Treatment (regularly $165) uses desert herbs and red Sonoran clay to detox skin; juniper and sage oil rejuvenates. See our Phoenix destination guide for general trip-planning information, then use our Travel Search price comparison tool to find the lowest rates and travel deals on flights, hotels, vacation packages, and more.